Loch Leven Ospreys and Hummingbird Hawkmoths! The latter was sighted on the buddleia outside the RSPB shop and we marvelled as this tiny hummingbird-like moth extended its proboscis to taste the nectar! 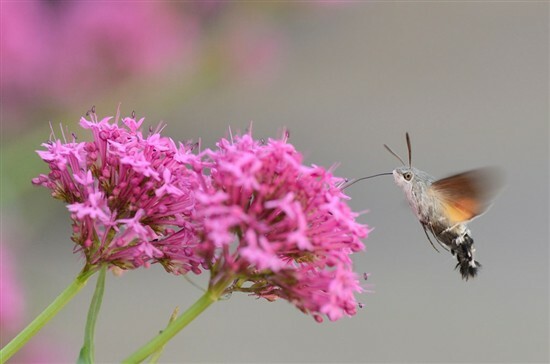 The hawkmoth is supposed to have a remarkably good memory and may return to the same flowerbeds every day at about the same time although this hummingbird hawkmoth has only been seen once so far this August. Equally exciting, the first ospreys have returned to Loch Leven as they begin their migratory journey south. The number of birds seen and the frequency of sightings is likely to increase now until the middle of September. Last September at least a dozen ospreys were visible over the loch in a single sighting from the Visitor Centre. With a wing-span of around 1.7 metres, the osprey often climbs up to 70 metres above the water when fishing. When it dives, it half-folds back its wings (as in the photo below) and thrusts its feet and talons forwards into the water, diving up to a maximum depth of 1 metre. I have seen an osprey eating its prey on the fence posts at the edge of Loch Leven (a favourite feeding site of this fishing raptor at the reserve) but I have never been lucky enough to see one dive and catch its prey! A little egret has also been seen in recent weeks, as as the grey heron, another formidable fisher and flier. In fact, so formidable a fisher is the heron that fishermen used to believe that "any bait anointed with the marrow of a thigh-bone of a heron, is a great temptation to any fish." (2) Heron are often present at RSPB Loch Leven, either by the water's edge or taking to the air with their dramatic, rhymthmic flight. Flocks of birds have been gathering on the loch in recent weeks as summer begins to turn to autumn. We were lucky enough to see seventy curlew (visible from the Cafe on the grassland in front of the Waterston Hide), plus flocks of mute swans (39) and greylag geese (50) out on the loch, and 20 Barnacle Geese were sighted towards St Serf's Island. There were also wigeon, black-headed gulls with their growing youngsters, great crested grebe and one little grebe with three ducklings. There is a definite feel of autumn approaching at the reserve now: the grasses are beginning to bleach, the thistles have burst like pillows, the rose bay willow herb has lost its flowers, and there is an urgency to the swallows' cries as they encourage their second brood to put on weight before the long journey south to Africa. Sadly, it won't be long before we see them leave. References: (1) and (2) from Birds Britannica by Mark Cocker and Richard Mabey (Chatto & Windus) 2005.